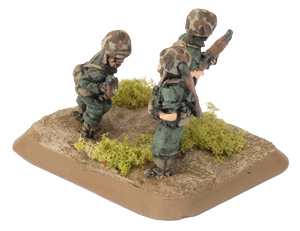 Includes six M1919 LMG teams, one Command Rifle team, one small three-hole base, six medium four-hole bases, and four hole plug sprues. 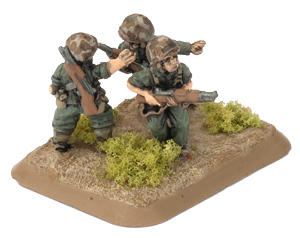 This blister pack gives you company-level machine-gun support for your US Marines, with the M1919 Browning light machine-gun. 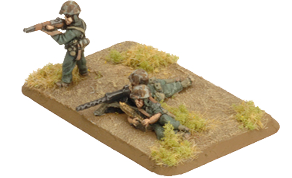 Whenever the Marine Rifle Platoon advanced, the Company Machine-gun Platoon would not be far behind. 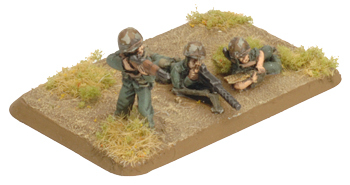 Equipped with up to six M1919A4 .30 Cal Browning Light Machine-guns or M1917A1 Heavy Machine-guns, the platoon could lay down a considerable volume of fire that was vital for stopping a Japanese Banzai charge. Although the guns could be deployed together they were typically spread between the Rifle Platoons to cover the greatest possible field of fire. Introduced into service in 1919, the M1919A4 was an air-cooled belt-fed light machine-gun, in widespread use throughout the war, in all ervices. 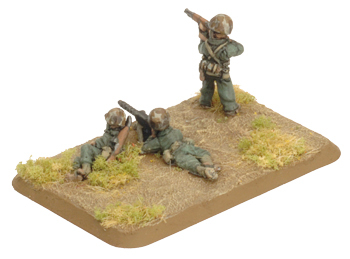 Its primary role was as an infantry support light machine-gun, in a role in which it excelled. This weapon lacked a quick change arrel, and fired from a closed bolt, which meant gunners needed to be well trained and observe fire control discipline to prevent cook-offs or run-ons. 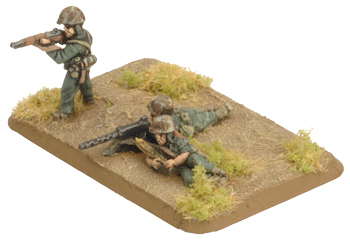 M1919 LMG Man-packed 16"/40cm 5 2 6 ROF 2 when Pinned Down or moving. 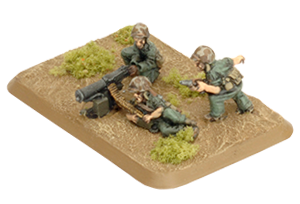 Note: The Company Machine-gun Platoon in Gung-Ho allows you to replace all M1919 LMG teams with M1917 HMG teams – upgrading to the water-cooled .30 calibre M1917 Browning heavy machine-gun, for more range and a higher rate of fire, albeit at an increased point cost of +10 points per team. 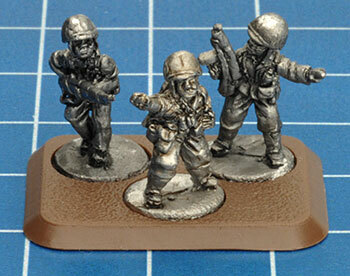 If you want to use this option, you can purchase the Machine Gun Platoon blister (US774). 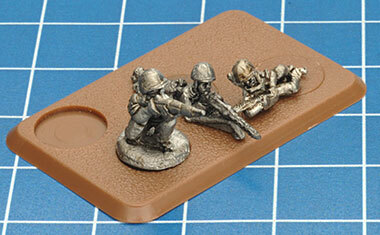 To assemble the Command Rifle team, simply arrange the Platoon Commander figure, one NCO figure and one rifleman figure on the Small three-hole base provided in the blister pack. 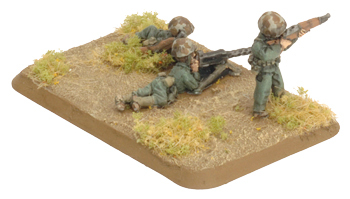 Each M1919 LMG crew consists of a gunner and tripod (k.) and .30 cal LMG (l.), as well as either a reclining or kneeling loader (i. or j. ), on a medium base. 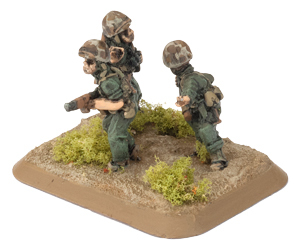 Each LMG team should also have a third figure – either an NCO or rifleman (d. – h.). 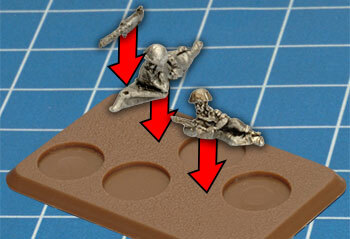 You can use base plugs to fill in any unused holes.